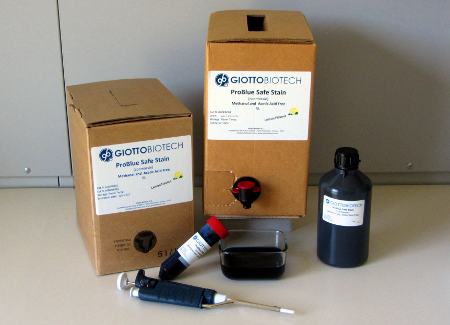 ProBlue Safe Stain: a non hazardous solution for staining proteins on polyacrylamide gels. Coomassie stain does not require addition of methanol and acetic acid for destaining and produces blue bands on a clear background. ProBlue Safe Stain: a non hazardous solution for staining proteins on polyacrylamide gels. Coomassie stain does not require addition of methanol and acetic acid for destaining and produces blue bands on a clear background. Rinse the gel with deionized water (the gel have to be completely covered by the water) and heat in a microwave oven for about 2 minutes. Pour ProBlue Safe Stain solution on the gel until the gel is completed covered and heat in the microwave for 2 min. Incubate the gel with ProBlueSafe Stain for 2 minutes and discard the ProBlue Safe Stain. Rinse the gel with of deionized water (the gel have to be completely covered by the water) and boil in the microwave for 2 minutes. Discard the water and repeat the last step till the protein bands become clearly visible.